A year ago I started this blog, because it concerns me that so many capable readers stop reading between 3rd-8th grade. After making their way through the Harry Potter and Percy Jackson books, too many children think there are not any more great books to read. I wanted to help parents respond when their children proclaim, "I don't read, because I can't find a good book!" With this in mind, I have purposely left out the many amazingly illustrated and written picture books. The intended audience for these masterpieces are adults reading aloud to early readers. Among this genre of books, you will find works of art and books of true wisdom. The North Star by Peter H. Reynolds belongs in this category. It is dedicated to "all of the parents and educators of the world, and to those who are brave enough to follow their dreams." The words and the drawings effectively point out the well worn paths of decision making and the possible effects of choosing one of them. In contrast they add beauty and wonder to the paths less traveled. The story gives voice to following your own instincts and dreams. It celebrates the individual. This book is a touch stone for me and my son. When we hit bumps or times of indecision, I pull it out and read it. Miller can predict the conversion that will follow, if he arrives home to see the book out in the living room. For us it is a physical reminder to live the words of Henry D. Thoreau, "Go confidently in the direction of your dreams, live the live you have imagined." 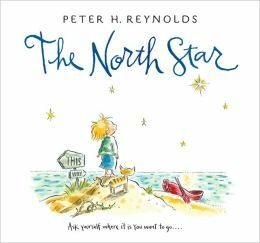 If you are looking for some advice on how to navigate your own path after reading, The North Star, check out this old post about Ish, also by Peter H. Reynolds. After a year of extolling the virtues of reading, I feel I need to interrupt this important work to tell you about this great movie. I must admit, I am not one to go to the movie theater. I love movies but prefer sitting at home and watching them in my pajamas. After hearing all of the praise for this film, I was persuaded to make it to a Sunday afternoon matinee. Since this is out of the ordinary for me, I insisted that my son accompany me. He was, instead, strongly suggesting that he ought to be permitted to see the new GI Joe movie, for the second time, I must add. I put my foot down, and boy am I glad I did. This film was not only informative, A+ on the teachable moments, but touching and inspiring. The plot moved along seamlessly, with the help of subtitles and an effective movie score. 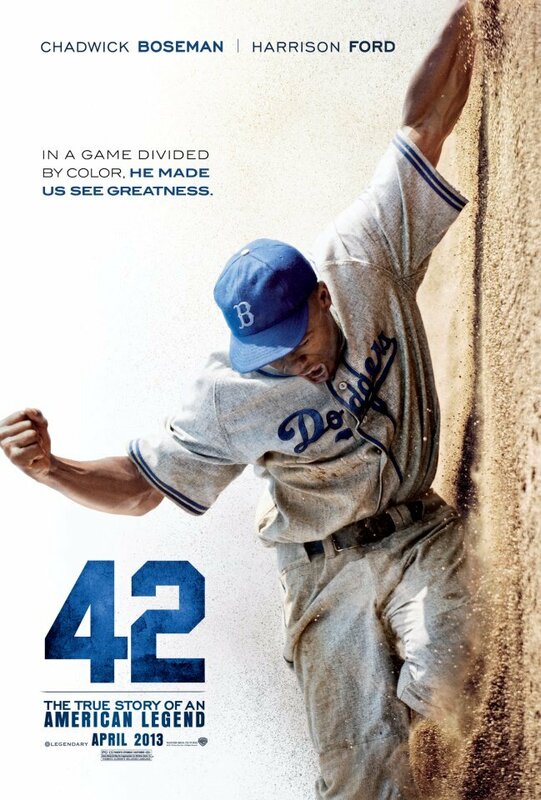 The film concentrates on Jackie Robinson's first two years in major league baseball. It gives equal attention to Robinson and the Brooklyn Dodgers' owner, Branch Ricky. I knew very little about these two men and their contributions to the civil rights movement. The movie educated me without preaching. It shed light on how far we've come and how far we still have to go. Now, it did not have the action and fantasy that my son has grown accustomed to in his movies and books, but it was a story well told. So well told, in fact, that it's themes occupied our conversation for the afternoon. It is my hope that it will inspire my son to look to the pioneers of the past who have helped us get to where we are today. When my son was quite young, perhaps four, he asked his Montessori Director for a lesson in botany. The Director had an interest in him working on his reading, and she reminded him that once he learned to read, he would be able to teach himself anything he wanted to learn. He received the lesson, it was about leaves, but what he remembers most about that moment was that he really needed to master reading. He spent most of his early reading years in nonfiction books about animals and plants. As a matter of fact, it took a bit of work to find fiction that would suit him when he became an independent reader. Luckily, realistic fiction gave way to historical fiction, fantasy and science fiction, and today you will rarely find him without a book. Sadly, the book is rarely nonfiction, because it is hard to find one interesting enough to keep my 12 year old's attention. This is the story of the plotting, the risk-taking, the deceit, and the genius that created the world's most formidable weapon. This is the story of the atomic bomb. It is written in short, clear chapters that uncover the details of this secret operation, that would forever change warfare for humanity. It is one of those books that makes you want to learn more about the time period and what would come next in the history of the world. It has gotten me thinking a lot about the Cold War. I believe it would appeal to any capable reader, even an adult, looking for a primer on the creation of the bomb. Many of us know what the outcome of its use was, but few understand how it was developed. If you or your reader like to learn, you ought to check out Bomb! When ever I get a chance, I like to go listen to storytellers. There is something different about the experience of hearing a story rather than reading it. I may have mentioned if before, but my son regularly surprises me my saying, "Mom, in this book I heard..." He is an avid user of the audio book. I must say, for me, getting to listen to a story is luxurious, especially if it is told by a master story teller. With this idea in mind, I am always on the look out for a story that would make a good read-a-loud. It would be hard for me to list the elements a book must contain in order to be included on such a list, but my interest in reading the book again must be one of them. I believe the best story readers are familiar with the text and can play all of the parts convincingly. I have just finished a great read-a-loud book, Goblin Secrets by William Alexander. In it, we meet a young orphan, Rownie, a small version of his older brother's name Rowan. He inherited the name for he was given none as a baby. When we first meet young Rownie, he is living with his grandmother Graba. His life is meager and lonely, as his brother is missing. Graba isn't really is grandmother. She is the witch of Southside and she takes in orphans to do her bidding. As you might guess, Rownie has special qualities that make him less than content in his life with Graba and the Grubs. While on an errand for Graba, Rownie makes a choice that will forever change the course of his life. Alexander has created some particularly loveable and despicable characters. The conversations in the story are lively and keep the story moving along smoothly. When I read this book to children in 3rd-5th grade, I am sure this carefully constructed story will roll off my tongue and entertain my audience. I am just as sure that new facets of the story will reveal themselves with each read so I look forward to sharing this one many times.